Why do buyers care about recurring revenue? Chances are, if you’re reading this, you’re thinking about selling your business and, if that's the case, chances are you’ve already talked to a couple interested parties for casual conversations. Threfore, it’s likely you’ve been asked what percentage of your revenue is recurring. This brings up an interesting question: Why do potential buyers care so much about recurring revenue? If growth is substantive and margins are high, why does it matter whether revenue is recurring or not? Furthermore, how do you measure recurring revenue? If you’ve done 5 different implementations for a client over the last 5 years, does that count as recurring? What about regularly scheduled equipment upgrades? Recurring revenue is a seemingly simple term that is deceptively complex. So let’s talk about it! Recurring Revenue: What is it? Generally, potential buyers evaluate recurring revenue as revenue that is contractually reoccurring or subscription based. For example, a landscaping company that signs a 5 year contract with a corporate campus to provide weekly services could call that recurring revenue, a SaaS software company with subscribers could call that recurring revenue, and an IT services business that signs monthly maintenance contracts on the equipment they sell could book that service as recurring revenue. But it’s murky waters. Does a 2 year contract paid monthly with no guarantee of renewal constitute recurring revenue? What about if a customer refreshes equipment purchased from a business like clockwork every two years but doesn’t have an actual contract in place? A good rule of thumb is that any revenue stream that is paid repeatedly and doesn’t have an impending end can be counted as recurring revenue. However, the murkiness around that definition is why many buyers look at both recurring revenue and customer retention to get an idea of the health of revenues. Customer retention: A better way to measure recurring revenue? Recurring revenue is hard to measure exactly and many buyers will use the metric of customer retention to figure out stickiness of revenue. Customer retention can be measured a couple different ways but it tries to get to the heart of one thing: how sticky are your customers and how does their spend change over time? Using this, you can figure out total customer churn. For the example company above, customer retention was 93% for 2018 and in the 90’s for the last 4 years. This is a solid company! Both companies are growing by the same amount. However, company 2 is a much better business. Customer retention is 100% and most customers are spending more money year after year. In the meantime, company 1 has lost 40% of their customers and their largest customer makes up the majority of the business. 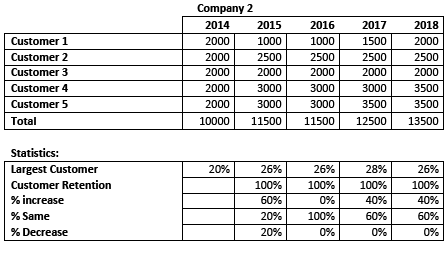 Company 2 looks much more like a high recurring revenue business, while company 1 looks like a project-based business with some recurring revenue. Let’s talk a bit more about the implications of these differences. In our example above, revenues at our subscription business are smoothly increasing. This makes it much easier to create a plan for growth, estimate what personnel needs will be, and allow for longer term strategic planning. For the lumpier business, the management team would have started the period by catering to all customers and setting in motion the same strategic growth initiatives. However, the loss of 40% of their customer base while their biggest customer continued to grow resulted in more of their efforts being catered to that one particular client. For someone who is investing a lot of money into the business, it’s important to be able to accurately plan how to grow the business and where to focus their efforts. This is much easier if you know how much money is going to be coming in each month or year and from whom. Recurring revenue businesses are nice in that, even if you do nothing, revenues will continue to roll in. If your business is transaction or project based, you risk losing everything during a down year. For a potential buyer, the prospect of not having a business in a down year is a non-starter. In addition, many subscription or maintenance-based businesses become a vital piece of their customers’ infrastructure and are irreplaceable while many businesses might choose to hold off on an expensive project if the economy turns south. Like it or not, chances are whoever buys your company is going to use debt to finance a portion of the purchase. Their lenders love recurring revenue. A company that has predictable revenue is also one that can make predictable interest payments. If the new owner is able to accurately forecast the revenues of the business, they can finance the purchase with a higher percentage of debt and magnify their own return. Recurring revenue is important to buyers; it helps them get a better picture of the business and plan their future strategy accordingly. But it should also be important to business owners for the same reasons. 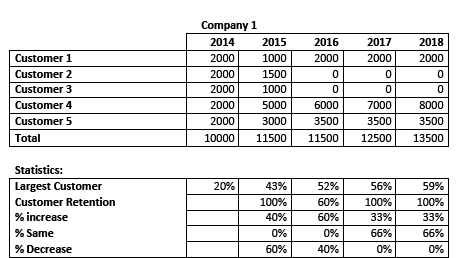 Understanding what recurring revenue is, how to generate it, and why it is important is helpful not just in acquisition discussions but as you’re planning your overall corporate strategy.